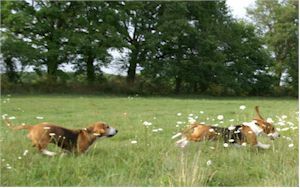 Even though most Bassets Artésien Normand are familydogs, enjoying a good walk every day, it is necessary to emphasise that the Basset Artésien Normand has excellent hunting qualities. As the French say, it is a ‘workinghound’, from the type ‘Chiens Courants’. He is fit for the hunt by foot. He can take the initiative to find the traces of game, so called ‘quêter’, to drive the game out of the bushes, ‘lancer’and to persuit the game, ‘mener’. They can hunt individually or in a pack, consisting of 4, 6, 8 and more hounds depending on the terrain and the game to hunt. 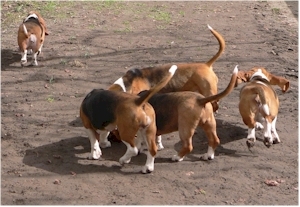 An ideal pack is composed of hounds with different talents: The ‘chien de tête’, the hound that takes the initiatives; the ‘chien de centre’ the one just in the middle to follow and the ‘chien de chemin’ that carefull seeks not to forget a single trace. Finally a ‘creanceur’ the hound with the ideal quality to stay on track, regardless what game is crossing. 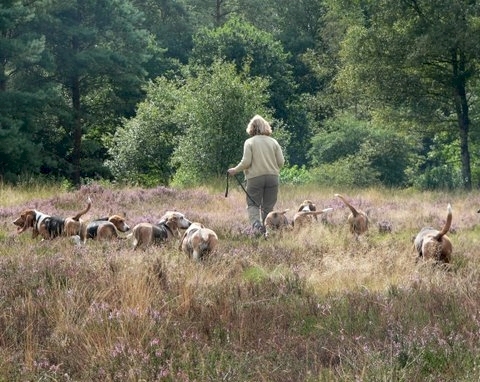 It is a magnificent view to see a pack of French Bassets hunting, the more when you hear their “musique’. Their bark that expresses their emotions.